Fetal Alcohol Syndrome (FAS) is a series of birth defects associated with alcohol consumption during pregnancy. 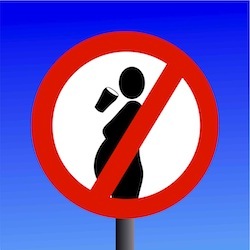 The disorder was first introduced in 1972 when physical feature differences were noted in infants born to mothers who consumed alcohol during pregnancy. Since that first description, FAS has been the topic of research hoping to reveal just how alcohol affects the fetus and to what degree infants, children, teens and adults are affected after fetal exposure. New research suggests that timing plays an important part in how alcohol affects fetal development. FAS can cause a wide range of defects, including behavioral problems and physical defects. The first physical defects noted were smaller than normal eyelid openings and thinning of the lips. It is estimated that one in every 750 births is affected by FAS, but many more infants could be affected because FAS is typically diagnosed after physical defects are noted. Behavioral impairments without physical deformity are often not directly linked to FAS. For the purpose of the study, lab mice were given large amounts of alcohol on day seven of gestation and 36 hours later. The seventh day of mice gestation is equivalent to the 3rd week of human gestation. Just 36 hours later is equivalent to the 4th week of human gestation. At the end of the pregnancy, the fetus was scanned using 3D imagery. The first set of mice showed physical deformities commonly associated with FAS, but the second group of mice showed a completely different set of deformities, including broadening of the brain and shortened upper lip. Researchers were surprised by the difference in physical manifestations with a time span of just one human gestational week leaving them to wonder just how many children are affected by FAS who don’t present with the typical physical deformities. While the imaging has yet to be tested on human patients, doctors noted, “Overall, the results of our studies show that alcohol can cause more than one pattern of birth defects, and that the type and extent of brain abnormalities – which are the most devastating manifestation of prenatal alcohol exposure – in some cases may be predicted by specific facial features.” Many of these facial features mentioned are not currently part of the diagnostic set used to establish an FAS diagnosis. Researchers also noted that the effects of alcohol consumption on the fetus occurred, in this study, before most women would find out they are pregnant. By the time pregnancy is verified, the damage is already done. Source: Robert J. Lipinski, et al. University of North Carolina School of Medicine. August 22, 2012.